← Bradfield, 75 years on – part 5: using Bradfield’s abandoned tunnels – trains, trams or tourism? Many previous HSR proposals started by nominating ambitious routes and advanced, expensive technologies, setting very high hurdles from the beginning in terms of establishing a viable business case. These approaches also required federal and state governments to work cooperatively and provide substantial financial support, a difficult ask when there are billions of dollars involved and only two or three states at most will ever benefit directly. Until now, these barriers have proved insurmountable. While it is still seeking ultimately to introduce full-blown HSR, this time the government seems to be taking a more measured approach. It has appointed UK expert Prof. Andrew McNaughton “to confirm the most appropriate routes, train speeds and station locations” and to provide advice “on what is possible and what would be involved” in improving travel times in these corridors. This would involve “a new approach to the delivery of fast rail… identifying immediate improvements to existing rail corridors, while undertaking long-term visionary planning.” These plans are intended to support the 20-Year Economic Vision for Regional NSW, a “comprehensive vision for regional NSW for the next 20 years and beyond” which has prioritised the need for “better connectivity between regional centres, and from cities and international gateways”. There is also an increasing perception that Victoria is setting the pace in this area and leaving NSW well behind. The Fast Rail option bears a strong resemblance to the approach taken by the Victorian government which has been investing in its conventional V-line regional rail services for decades, leading to its current $1.75 billion Regional Rail Revival program. There is also some similarity between the NSW proposals for a high-speed network and the re-elected Victorian government’s commitment to “fast, high-capacity rail” to service the western part of the state (though the then Victorian opposition leader’s pre-election plan for “European-style High Speed rail” was probably closer in scale and ambition). Fast or High-Speed Rail – What is proposed? Western Route including Lithgow, Bathurst and Orange/Parkes. The following table provides a summary of these routes and compares current travel times, both rail and road, with those proposed in the Premier’s statement. All the routes provide a mix of regional and outer commuter services to Sydney, with the Northern and Southern Coastal routes also providing intercity links to and suburban services for Newcastle and Wollongong respectively. All but the Southern Inland route have significant proportions of electrification. The Northern route to Newcastle has by far the biggest population in its catchment at over one million people, but the Southern Inland and Southern Coastal routes also have significant populations and all these corridors are experiencing substantial growth. On the other hand, the Western Route has only around a fifth of the population of the Northern Corridor. All the corridors especially the Northern, Southern Coastal and Western Routes, have to contend with the rugged terrain which surrounds the Sydney Basin. This is part of the reason that current NSW services are so slow, with trains averaging under 70km/h. The Southern Inland route to Canberra is the fastest, but still only manages to average 80km/h. Despite being the fastest, the Southern Inland Route is also currently the least competitive with road travel in terms of travel times partly because of the parallel motorway all the way to Canberra. Only the Northern Route from Newcastle comes close to being competitive with road travel, at least out of peak hour, but even then it is about 15 minutes slower. How fast is “Fast Rail”? The Transport Minister’s comment that “upgrades along existing rail alignments [would] provide services of at least 200km/h, slashing travel times by one third” is only partly borne out by the proposed Fast Rail times offered in the same media release. The one-third reduction is achieved only in some of the sections closer to Sydney. Over the whole of each route (apart from the Western route, for which no Fast Rail time estimates are offered) the average reductions proposed average around 25%. The increased speeds required would be 80-100km/h for the two coastal corridors and 100-130km/h for the Southern Inland route. Coincidentally this would also make rail journeys competitive with current road trip times in each corridor, which suggests that the 25% reduction may have been set as an arbitrary target with this objective in mind. These improvements would require targeted upgrades of existing infrastructure. On the Fast Rail Future website these are identified as including “junction rearrangements, curve easing, deviations, passing loops and level crossing removals”. While the website also mentions 200km/h trains, these speeds could probably be achieved with 160km/h rolling stock. Some of these measures have also been proposed in relation to the Northern route in the NSW government’s proposal for investigation to the federal government’s Faster Rail investigation initiative. This proposal was one of three selected for the federal government to provide matching funding to develop a business case. There is a dramatic jump from the relatively modest speed gains proposed under the Fast Rail option to the targets set for HSR services. As with Fast Rail, no travel times were provided for the Western Route, a realistic if unacknowledged admission that HSR is unlikely ever to be feasible in this corridor. The suggested HSR travel times for the other three routes are based on a somewhat arbitrary average reduction of 75% on those currently offered, establishing a maximum of 45 minutes for trips from Newcastle and Nowra and only an hour from Canberra. Effectively the current train speeds in all three corridors would be quadrupled, up to 200-220km/h for the Northern and Southern Coastal Routes, and a substantial increase from 80 to 330 km/h for the Southern Inland corridor. This would make the latter directly competitive with flight times between Sydney and Canberra. Clearly this level of speed increase would involve much more work than the Fast Rail option, as the Fast Rail website acknowledges. Completely new HSR lines would need to be constructed in each of these corridors requiring major bridge work and tunnelling, particularly for both the Northern and Southern Coastal Routes. A completely new fleet of trains would also be required, capable of 250-350km/h speeds, and the overall level of investment needed would be substantial. Given the level of funding involved it is unlikely that more than only one or at most two routes would be selected for full HSR, with the most likely candidates being the Northern route as far as Newcastle and the Southern Inland route to Canberra, given their current populations and growth potential. 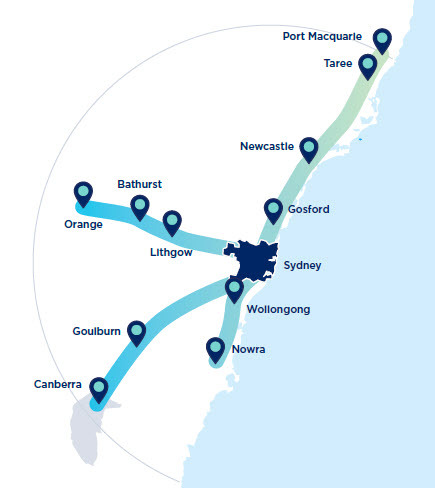 These routes would also offer opportunities for stations such as Goulburn and Newcastle to act as hubs and interchanges for conventional regional train services. Elements of HSR could also be adopted for the Southern Coastal route if a new alignment is eventually required because of stability issues with the current corridor. Should we follow Victoria’s lead? The aim of the first phase of Fast Rail appears to be to reduce travel times through gradual upgrades to all the nominated lines and the roll-out of new but conventional rolling stock. The work involved would be extensive, but it is probably within the budget capacity of the state government. As noted earlier the template for this approach appears to be the Victorian $1.75 billion Regional Rail Revival program which aims to upgrade every regional passenger rail line in Victoria and is jointly funded by the Australian and Victorian governments. This appears to be good value for money, but it builds on a history of investment in infrastructure and rolling stock that Victoria has made in its regional rail network in recent years. To take one example of the outcomes of this history of investment, journey times on the 162km line from Melbourne to Bendigo are now as low as one hour 44 minutes. This is an average speed of 93km/h, which is faster than any regional or intercity services on the routes nominated by the NSW government. The resulting economic benefits for cities such as Geelong, Ballarat and Bendigo demonstrate the potential impact even moderate-speed regional rail services can have. There are also important differences between the regional train environments in both states. Victoria is flatter and more compact than NSW, with most of its regional cities located closer to the state capital than their NSW counterparts. On the other hand, while Sydney’s immediate urban neighbours (Newcastle and Wollongong) are further away than Geelong is from Melbourne, they are significantly larger in population. This has led to major differences in the organisation of these networks. Both are divided into two broadly similar categories – intercity or outer commuter services, and longer-distance regional trains. In NSW this distinction is reflected in the type of trains used – double-deck electric trains for the former and diesel DMUs for the latter – but in Victoria both types of service are provided entirely by diesel trains. While both systems have experienced growth in recent years, the combined NSW intercity and regional rail and bus network carried 40.89 million passengers in 2016-17, more than twice as many as its Victorian counterpart (19.30 million) – though less than 2 million passengers were carried on NSW regional trains and buses. Despite these differences NSW can learn much from the Victorian playbook in relation to the Fast Rail roll-out, but it will probably have to take its own path to the more complex, expensive and elusive goal of introducing HSR. This is because in Victoria a gradual approach to upgrading existing tracks to HSR standard is more feasible, coupled with new train paths through the metropolitan area. In NSW “true” HSR will require very high levels of investment in brand new lines right from the start, a situation made more difficult by the need to accommodate suburban, intercity and regional services as well as freight trains on most of these routes. However, these complexities and the continuing concern about the viability of HSR should not prevent whichever party forms government after the NSW election from following Victoria’s lead in making a medium-term investment in moderately fast trains. This entry was posted in Infrastructure, Population, Public Transport, Regions, Sydney metro area, Transport and tagged Fast Rail, High Speed Rail, Infrastructure, Rail, regions, State Government, Strategic Planning, Sydney metro area, Transport. Bookmark the permalink. 1 Response to NSW High-Speed Rail: following Victoria’s example?